Rojo: Di Maria the Best Football player of Manchester United FC (MU) – The defender of Manchester United (MU) Argentine, Marcos Rojo, praised his compatriot Angel Di Maria as a talented player at Old Trafford. Rojo said sure Di Maria could perform better in the next season. MU brings in Di Maria of Real Madrid on August 26, 2014. The Red Devils should be poured funds amounting to 59.7 million pounds, which makes Di Maria broke the record as the most expensive player that bought the club's United Kingdom. However, the record is not directly proportional to the appearance of Di Maria. The Argentine player was considered to have failed to show his best game, so he much more to sit on the bench. Despite the difficulties in the first season, Di Maria has committed to stay at Old Trafford. Rojo also welcomed Di Maria's desire. According to Rojo, Manchester United FC needs a player as great as Di Maria. Rojo told Goal, that for him, a very talented player at Manchester United is Angel. 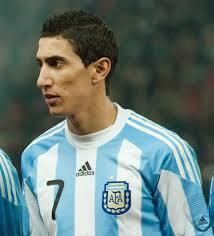 A lot of great players at the club, but Angel Di Maria is one of the best player in the team and the world. Rojo assess Di Maria did not perform optimally because of he has the difficulty to adapt along with the Red Devils squad. However, according to Rojo, it is reasonable for a new player. Last year was a difficult moment for Di Maria. He had some problems about adaptation, but that's normal. Every player who comes to the new country and the new league had to adapt to the difference and it is happening with Di Maria. He's likening himself with Di Maria's condition when first entering and adapting to the team of Manchester United FC. However, Rojo sure that Di Maria will perform well next month, like himself, as he explained. As quote of Rojo: Di Maria the Best Football player of Manchester United FC (MU).